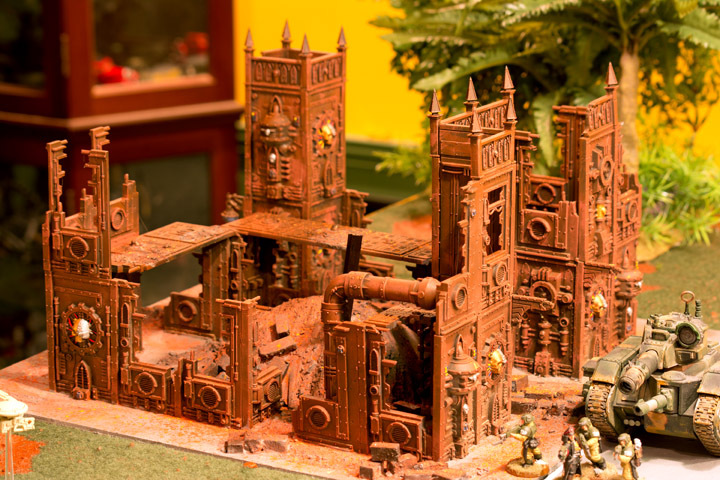 My manufactorum is painted in a red appropriate to the Adeptus Mechanicus. I enjoy making terrain, and I’ve wanted to try my hand at some 40K buildings. While it might be more flexible to construct the buildings on a thin MDF base, so they could be placed on any table, I opted for the extra detail of a very dedicated base that I intend to use for a City of Death table. These bases are thicker. As per my blog, Making Martian terrain tiles, my basic terrain base is a 15-inch-square, 3/8-inch-thick MDF board with a 3/4-inch-thick slab of polyurethane foam glued atop it. This is also the thickness I use for my street tiles. To add a sidewalk rising above the street, the building tiles have an additional 3/8-inch-thick MDF board atop the foam, which is carved to represent a sidewalk. Leaving an inch or so for the width of the sidewalks, the rest of the tile represents the building floor. I glue the wall panels to the MDF with Goop, an epoxy-like glue found in any DIY store. For my Games Workshop kits, I used their Thick Plastic Glue to build upwards. Buildings were spray painted their base color, then subsequent layers were applied using either a drybrush or with a faint coating of spray paint. 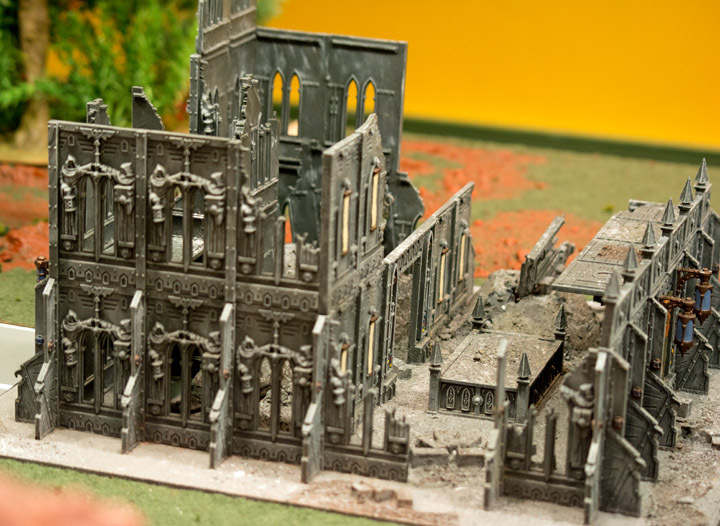 My Sanctum Imperialis was my second 40k building. After a coat of Testors’ Dull-Cote to protect the paint, pieces of foam and debris were glued down and painted. I added a few piles of “brick” created from polystyrene scrap, and I also took appropriately colored chalk to a sheet of sand paper and sprinkled the dust over everything. Once complete, another two coats of Dull-Cote were applied to ensure a good protective finish. Generally, I’m happy with the buildings. In reality, there would be a lot more rubble, and I’ll try that on a future building—and see how practical that is to play on. I think too much rubble is likely to interfere with play and, given what gamers are used to, the “realism” of significant rubble will be distracting. I also may build a few buildings on thin MDF board, foregoing any foam. This is a more traditional base and offers the flexibility of placing a building anywhere on the battlefield.